Why #40, Submit Poems to The New Yorker? This one is about my fear of rejection. Particularly, rejection as an artist. This hasn’t always been the case, but in the past decade, I’ve become wildly averse to finding out I’m not good enough. For a writer, that’s deadly. Writers must be ready, willing and able to be slapped-down. If not, our projects start being “not quite ready” or they get close, but “still need a serious rewrite.” Submitting my poetry to The New Yorker is a bold plunge. Granted, it’s like applying to Harvard. The New Yorker publishes the best of the best. And since I’m not a pedigreed poet, submitting my poems to The New Yorker is a giant leap, an almost guaranteed rejection. I don’t have an “in” with The New Yorker (not that I know of anyway), so I go looking for information online. The New Yorker website spells out exactly what I need to do. Poetry submissions: Poetry is reviewed on a rolling basis. Send up to six poems per submission, but please submit no more than twice in twelve months. We do not consider work that has appeared elsewhere (including Web sites and personal blogs), or translations that have already been published in English (the original text may have been published.) Simultaneous submissions are welcome; please notify us promptly if a poem is accepted elsewhere. Response time averages two to six months; after three, you are welcome to query the status. Mail paper submissions to: Poetry Department, The New Yorker, 1 World Trade Center, New York, NY 10007 (with an SASE enclosed). Beginning February 28th, we will no longer be accepting, or reading, e-mail submissions. Please upload your work via Submittable. I choose five poems, all written in the past year. I fuss with them until my old pattern becomes obvious: I’m just running down the clock, avoiding the hard part, which for me, is less about writing and more about sending my work into the world. My friend Martha Silano is a pedigreed poet. She’s got an MFA, teaches college courses, and is a published author of books of poetry. She wins grants and residencies. Garrison Keillor even read one of her poems on Writer’s Almanac for NPR. When Martha hears that I’m submitting my poetry to The New Yorker she’s thrilled. And then she gives me this pro tip: “Send your poems by snail mail so you can get a paper rejection letter!” Umm, ouch. But okay, I’m game to get something in the mail from The New Yorker besides the magazines and renewal notices. Thank you for considering the enclosed poems for publication in The New Yorker. Publicly, I write screenplays, but privately I write poems. Sending you these poems is part of a challenge I set myself on my fiftieth birthday: to face 50 fears. This year I plan to Get Arrested for a Good Cause (#17), Eat an Oyster (#34), Write and Perform a Stand-up Monologue (#27), and Travel to a Third World Country in a Rough Way (#7), among other scary things. Today I am tackling #40: Submit my Poems to The New Yorker. I so appreciate your time and consideration. I’m not allowed to post the poems I submitted because of The New Yorker’s publication policy (see above). But I might post them here if I get a rejection letter (on letterhead!) from the New Yorker. 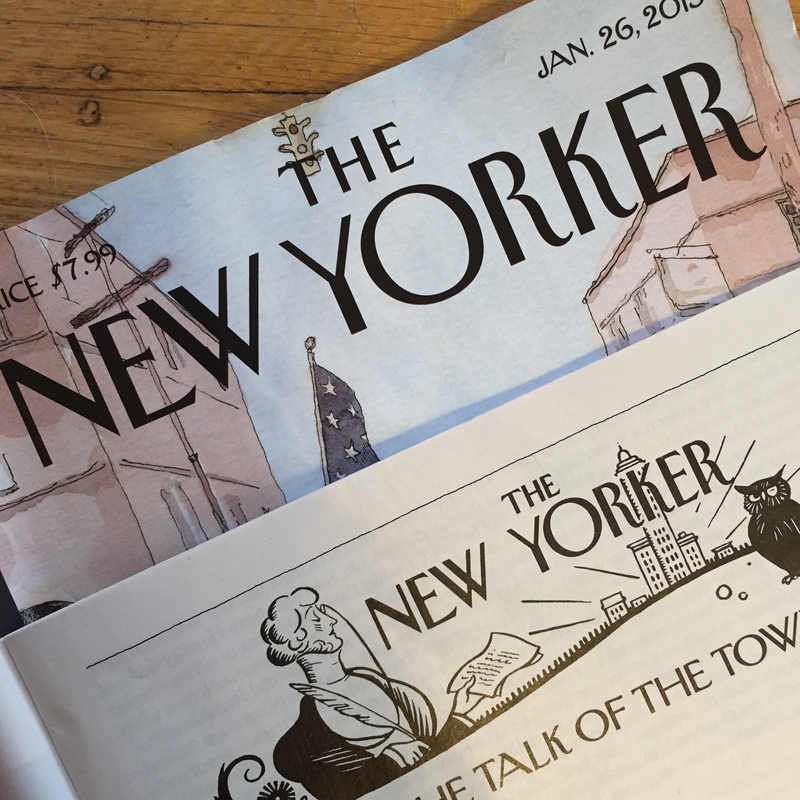 Or maybe we’ll all be flipping through some future issue of The New Yorker to read them in those hallowed pages. I mean, crazier things have happened! Update: June 30, 2015, I’ve just posted The New Yorker’s Response here.